Text neck has become an epidemic of pain. Use of computers, laptops, tablets, and phones has become a serious ingredient of everyday life. 63% (2 out of 3) of American adults own a smartphone. 73% (3 out of 4) of American teens own a smartphone. 24% (1 out of 4) of those teens go online almost constantly. Teens are shown to spend on average approximately 5000 hours on their smartphone per year and adults spend about 1400 hours per year! So what do these numbers have to do with your neck? There’s a cost to all of that phone usage. Luckily, there are things you can do to help. Text neck is the poor posture and associated pain and wear-and-tear of the spine that occurs from looking down at your cell phone, laptop, or tablet. The human head weighs about 12 pounds. Your neck can hold up that 12 pounds fairly easily. Bring your head to a 15 degree angle, though, and the weight that your neck holds up turns into 27 pounds. A 30 degree angle? Now it’s 40 pounds. Are you looking all the way down at a 60 degree angle? That’s 60 pounds that you neck is holding up. Imagine carrying an 8 year-old on your neck for several hours per day. I used to get tired after 15 minutes of carrying my little sisters around on my shoulders. Oww!! Tension headaches behind your ears, eyes, or in your temples. Upper back pain that aches and shoots from your neck. Local, sharp or stabby neck pain. Numbness or tingling down your arms, hands, and fingers. All of these symptoms occur as your body attempts to protect itself. As your muscles can’t handle the amount of stress you’re putting your neck under and become ropey, your body puts down adhesion as the next line of defense. Adhesion is a thick, gluey substance (made of fascia) that attempts to bring support to your neck. 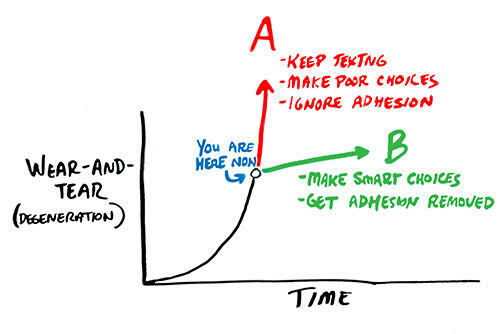 Adhesion can do the job temporarily. 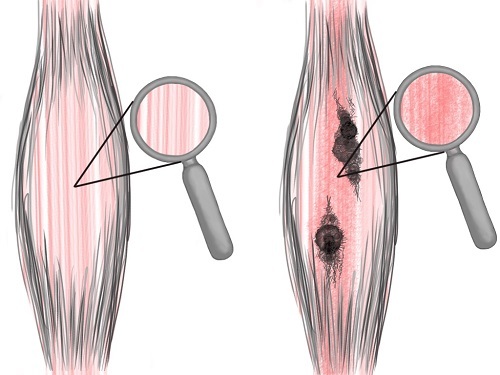 The excessive bone growth of osteoarthritis. The drying (and herniating) of cervical discs. Once these forms of wear-and-tear occur, there’s no going back to your young, healthy body. Which is why fixing and preventing text neck from occurring is so vital. There’s no returning from the dark side. Technology isn’t going anywhere. It’s here to stay. How then, do you live in today’s world, benefit from the advantages that your phone and computer have to offer while making sure you live to 60, 70, or 80 years of age without growing and debilitating pain? To make sure you don’t end up with a posture that looks like this? In order to be successful in pain prevention over your life-time, it’s really helpful to identify the fact that not using technology is not realistic. Once you accept that truth, you quickly realize that you have to do whatever you have to do in order to stay as healthy as possible. 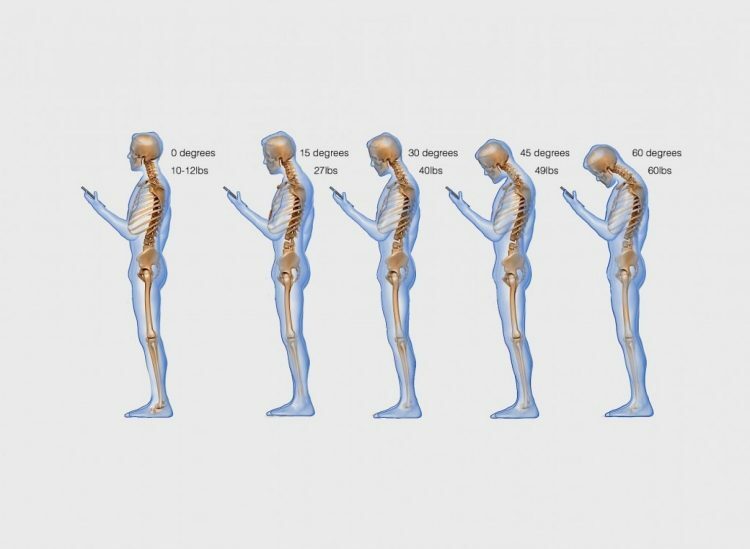 Texting, sitting, and other choices you’ve made have degenerated your neck up to this point. Going forward, it’s more choices that determine which path your neck will be on. Do you walk path “A” and keep doing what you’ve been doing and let your neck get worse? Or do you walk path “B”, make smarter choices, and get the adhesion removed to prevent your neck from getting any worse? You can’t ignore the problem. If you do, you’re asking for trouble. You can’t choose half-right solutions. If you do, you’re asking for more trouble. So, do what you need to do to get relief and fix your pain. If you don’t, you’re on the fast track to a lot of irreversible wear-and-tear. 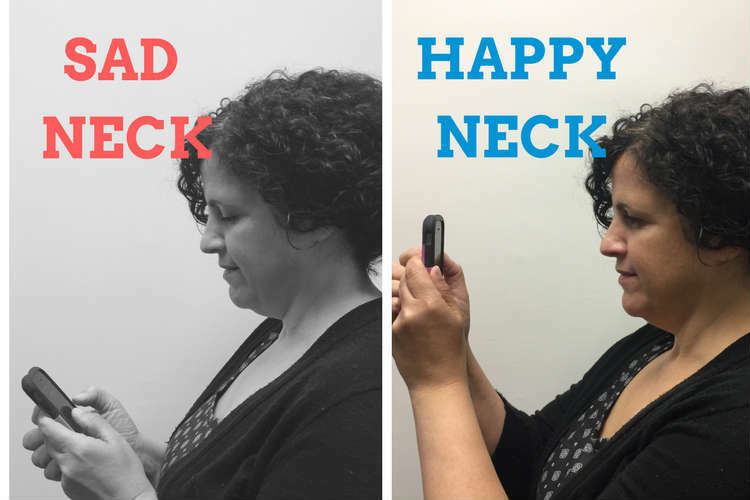 If you want relief from text neck, use these 4 tips. 1. 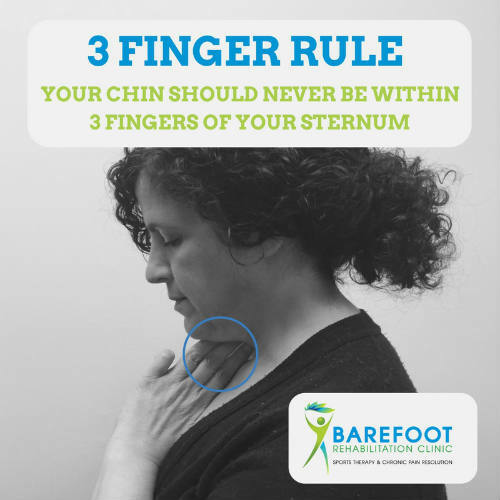 The 3 Finger Rule: Your chin should never be within 3 fingers of from your sternum. Instead, bring your phone up to meet your eye line. 2. 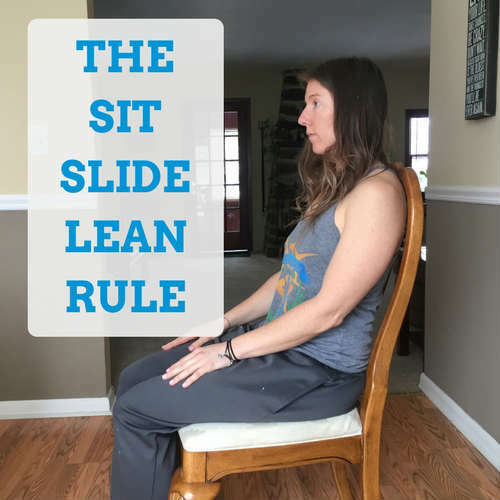 Sit-Slide-Lean: Keep the rest of your body in it’s correct posture. Sit or stand up tall with your chest open, wing bones down “into your back pockets, and sternum lifted a little. If you are sitting, the Sit-Slide-Learn rule applies to using your cell phone. 3. Take Micro-Breaks & Stretch: Just like for sitting, take breaks from looking at your phone for 2-5 minute periods to give your eyes a rest and to bring blood flow to muscles that have become stagnant. 4. Get Strong: The stronger you are, the less likely that your body will wear-and-tear muscles (with adhesion) and bones, discs, and cartilage (with arthritis, herniations, and more arthritis). 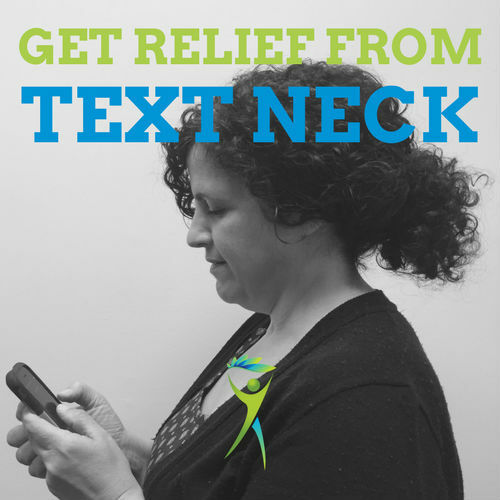 If you have text neck already, the 4 tips from above are 100% mandatory to not only get relief, but to slow down the wear-and-tear that your neck has already experienced. You should feel at least a little better by implementing those tips. … I highly recommend that you get your adhesions removed. The cool thing about muscle wear-and-tear is that it’s 100% reversible. And it can be fixed very quickly. The bad thing about bone, disc, and cartilage wear-and-tear is that once it occurs, there’s NO WAY to reverse or fix it. Therefore, it makes all the common sense in the world to prevent irreversible wear-and-tear the first chance you can get. You can get your adhesions removed through an experienced Integrative Diagnosis Provider who can make permanent range of motion changes like we did for our patient Leenie, below. Or if you live in Northern New Jersey, our practice, Barefoot Rehab, is the only certified practice at finding and fixing adhesions. 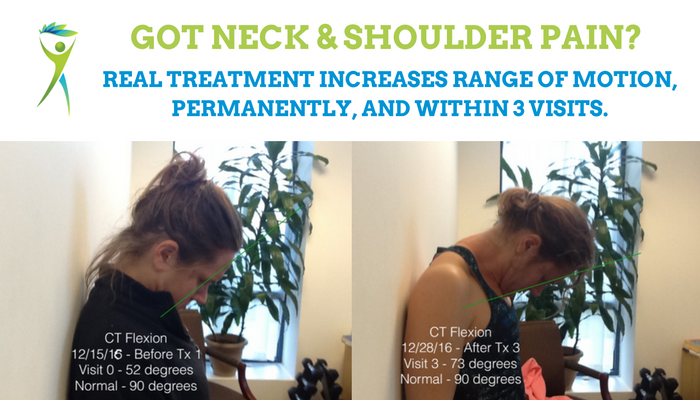 You can check our 3 of our neck pain testimonials or a neck pain case study. When you’re ready, give us a call at the NJ office (862-205-4847).